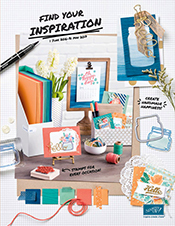 Today see the release of the brand new Stampin' Up! Annual Catalogue and I have to say "It's a Beauty!" Click on the link over to the left side of this post and then go make yourself a cuppa and sit down and click your way through to see all the new gorgeous goodies and trust me there are some gorgeous new goodies in there. If you would like a copy of your very own, just email me to organise that for you and of course if you would like to place an order then you know where to find me as well. Welcome to the beginning of a brand new Stampin' Up! year!